NASA astronaut Scott Kelly inside the cupola of the International Space Station during his one-year mission aboard the orbiting lab. Astronaut Scott Kelly, who recently completed an unprecedented yearlong mission aboard the International Space Station (ISS) and holds the American record for most days spent off Earth, will retire from NASA on April 1, agency officials announced today (March 11). After his retirement, Kelly will continue to participate in the research related to his one-year space mission, which was designed to help pave the way for crewed missions to Mars by shedding light on the ways long-duration spaceflight affects the human body psychologically and physiologically. "My career with the Navy and NASA gave me an incredible chance to showcase public service to which I am dedicated, and what we can accomplish on the big challenges of our day," he added. "I am humbled and excited by new opportunities for me to support and share the amazing work NASA is doing to help us travel farther into the solar system and work with the next generation of science and technology leaders." Kelly also flew aboard the space shuttle Discovery on its STS-103 mission to service the Hubble Space Telescope in 1999 and the space shuttle Endeavour's STS-118 flight to the ISS in 2007. He returned to the orbiting lab in October 2010 and served as commander of the station's Expedition 26, which ended in March 2011. While NASA has not announced concrete plans for any other yearlong ISS missions (the typical astronaut spends about six months up there), Kelly's American record for most total days in space will soon be broken: NASA astronaut Jeff Williams will roll past 520 days during his next mission to the ISS, which is scheduled to blast off next Friday (March 18). "Records are meant to be broken," Kelly said. "I am looking forward to when these records in space are surpassed." NASA Administrator Charles Bolden had high praise for Kelly and his contributions to the nation's space program. "When the first Americans set foot on Mars, they will be following in the footsteps of one of the finest astronauts in the history of the space program, my friend, Commander Scott Kelly," Bolden said in a statement. "All of us in the NASA family — and indeed in the broader scientific community — are grateful that he was willing to sacrifice time with his loved ones, meals that don't come in a bag, a cold beer, hot showers, cool autumn breezes, the sounds of birds chirping, the ability to lay his head on an actual pillow and so much more of the pleasures of life during his year of research and experimentation on the International Space Station," Bolden added. Kelly's identical twin brother, Mark, is a former NASA astronaut himself who flew on four space shuttle missions between 2001 and 2011. 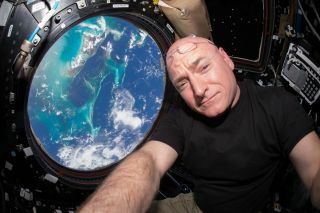 Though Mark Kelly stayed on Earth during the one-year mission, he's participating in it as well; scientists are using Mark as a control, to help identify any genetic changes that spaceflight induced in Scott. While nobody has stayed aboard the ISS longer for a single stretch than Kelly and Kornienko, the pair fell short of the overall record for most consecutive days spent off Earth. Cosmonaut Valeri Polyakov holds that mark; he lived aboard Russia's Mir space station for more than 437 days, in 1994-95. A cosmonaut also holds the overall record for most total time spent in space: Gennady Padalka lived in orbit for a total of 879 days during five missions from 1998 to 2015.